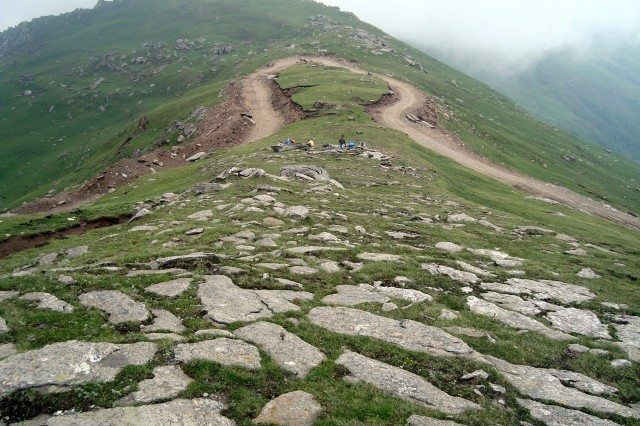 Chanshal Pass – The Banished Beauty - Ghumakkar - Inspiring travel experiences. This is the adventure science and engineering has deprived us of. The voyage into the unknown in search of the unknown was our ancestor’s privilege. In our world of mechanical excellence, there is a road to every place; and a vehicle for every road. And where there is no road, there is a vehicle that doesn’t need one. The once remote and inaccessible regions have turned in to popular tourist destinations. These days, it’s hopeless to look for an unexplored and untouched spot even in the remotest of Himalayas. The Chanshal Pass in that sense was nothing less than a wonder. 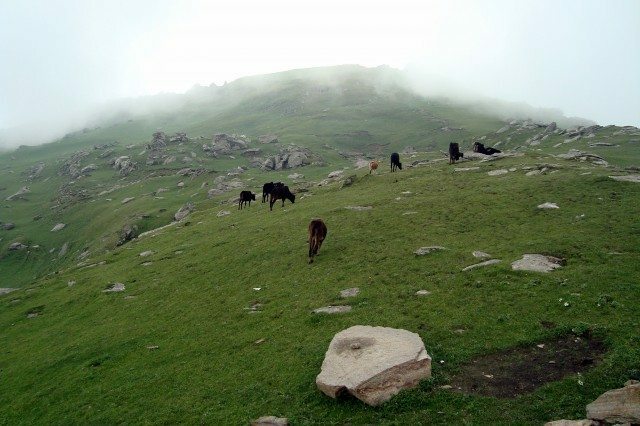 The Chanshal Pass and twin villages of Dodra and Kwar have a unique history. 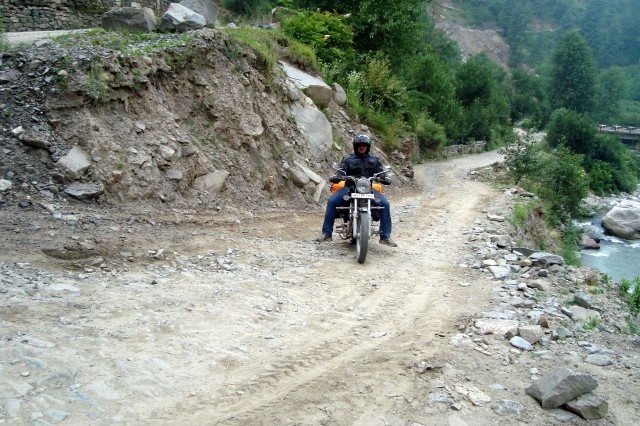 In the age of road revolution, this region was devoid of a motor able road till as recently as 2009. 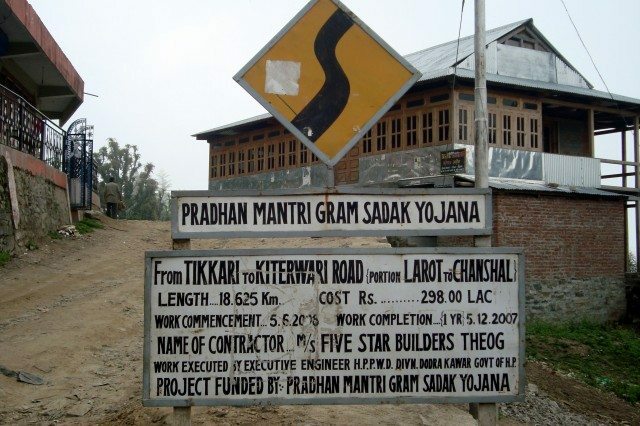 The local tribes didn’t support road development efforts by the Himachal government, as they believed their local deity didn’t permit of road building. 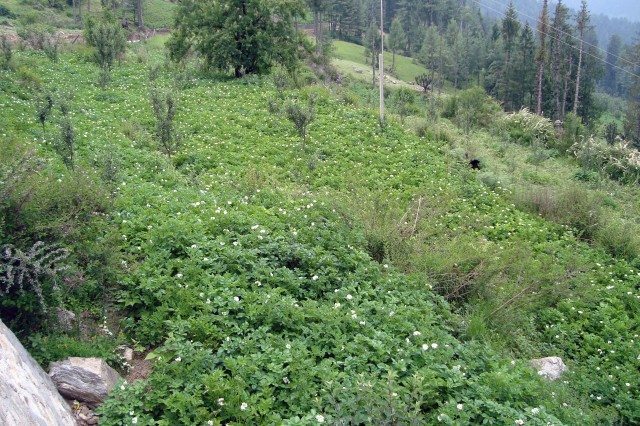 The deity finally approved of a road and in 2006, the foundation of the 92 km Rohru-Kwar road across the mighty Chanshal Pass was laid. 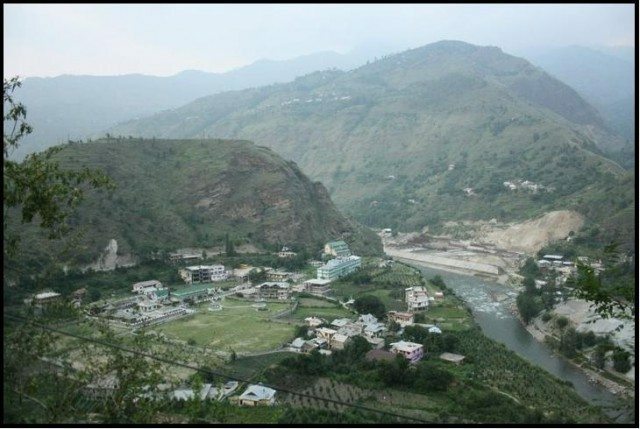 It took three long years to finally connect the landlocked Dodra-Kwar to the rest of Himachal Pradesh. 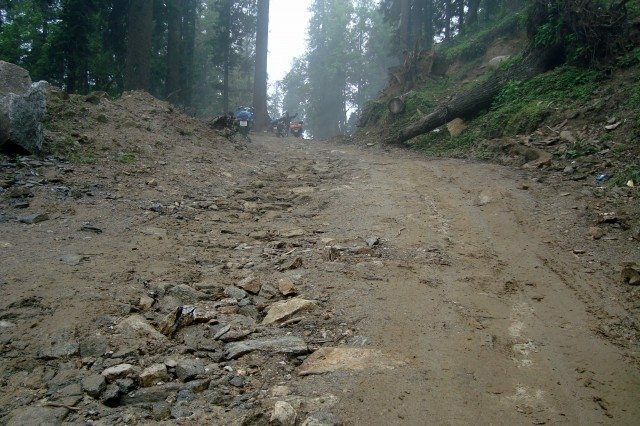 The inhospitable terrain hindered development work and the high amount of rain and snow atop the pass made matters worse. 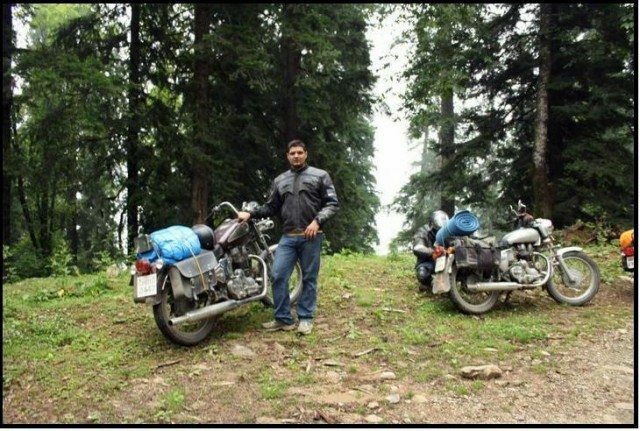 There were many stories of cars and bikes failing to conquer the Chanshal Pass in the past few years with the success stories few and far between. The mighty Chanshal rises above the Pabbar river valley in the Shimla district of Himachal Pradesh and adds elements of awe and grandeur to the pristine beauty of the region. After a year of extensive research, it was time to realize my dream of conquering the Chanshal Pass. But this ride was not going to be like our regular rides. 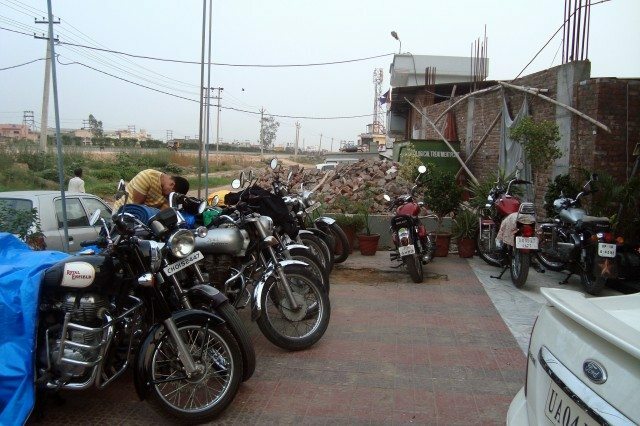 The NCR Royals bullet club from Faridabad had come up well recently owing mainly to its founder Rajbir Singh. Paahji (Vishal Chopra) got acquainted with Rajbir a while back and that acquaintance soon turned in to association. The Royals and us together were trying to plan a Ladakh ride this summer, but no suitable window was available for that. 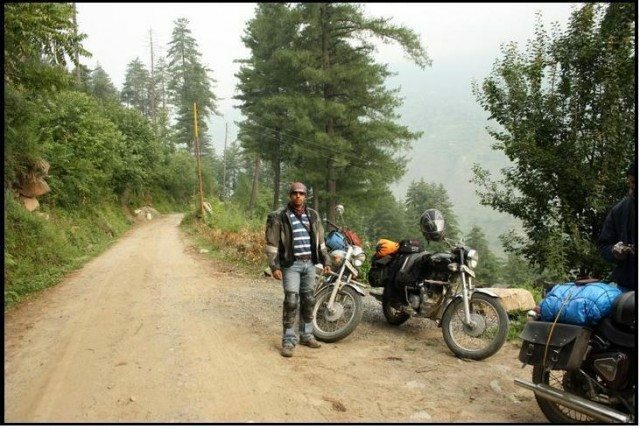 Hence, we planned this small but adventurous ride to the Chanshal Pass. As it was going to be a large group, we decided to carry tents. The enterprising Royals did all the pre-ride drills and we were ready to set off on 24th June. And there were Paahji and I on our identical silver Electra 4Ss. As I said, the Royals were still new as a club and had only done 3 rides before this one. But it was good to see a great deal of unity and comradery within the group. We had to set off early on Friday to make it to Rohru as was planned. The road beyond the NH-22 was not in good shape and there also was the potent threat of rain. Besides, we needed to reach Rohru before dark to set up the camp. But getting the large group to move fast wasn’t easy. I was up by 5 AM and so was Rajbir. But by the time everybody was geared up and on the saddle, it was 7-30 AM. As we took right at Zirakpur for Kalka, it started raining. We had to stop to set up the rain covers. With that delay, we reached Dharampur and stopped for a tea break. As the ride resumed, I led the way and we thumped towards Kandaghat. From there we took right for Chail. The road was in excellent shape and everybody was enjoying. Just as we were looking to build some momentum, we stopped again for another prolonged break at Sadhupul. Rohru was a far cry from that place. Anyway, we set off again at around 12 PM and soon found Kanwaljeet, Surjeet, and myself riding way ahead of the pack. Little did we know that we were not going see the rest of the pack till the next day. More on that as the ride unfolds. 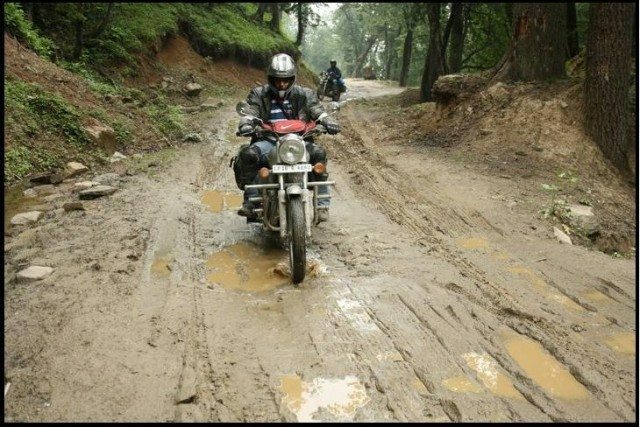 Close to Kufri, Kanwal had a skid on lose sand at a sharp turn. Thankfully, there was no major damage to man and machine. Kanwal received a scratch wound in the knee that needed attention but there was no medical shop at hand. We reached Kufri and got caught up in a jam for 20 odd minutes. All this while, there was no sign of the rest of the group. Free from the jam, we rushed to Fagu and took Kanwaljeet to the government dispensary for first aid. At that point, we talked with the rest of the group and were surprised to know that they hadn’t reached Kufri yet. We were growing increasingly impatient at the lack of momentum. So, we made a move for Theog. At Theog, we decided to get local news on the routes to Rohru. 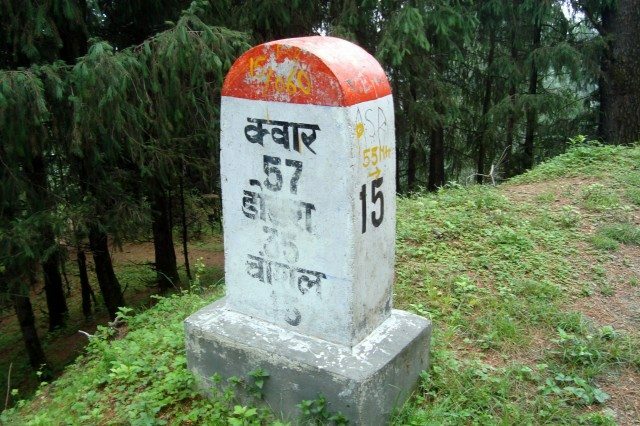 The crux of the information was that the Narkanda-Baghi route was slightly better but about 25 kms longer than the Theog-Kotkhai-Kharapathar route. The locals believed we wouldn’t have too much trouble on bullets even on the Kotkhai route. It was already beyond 3 PM. Time was running out and we had a tough decision to make. Multiple attempts at calling the rest of the group failed as nobody picked up the phone. 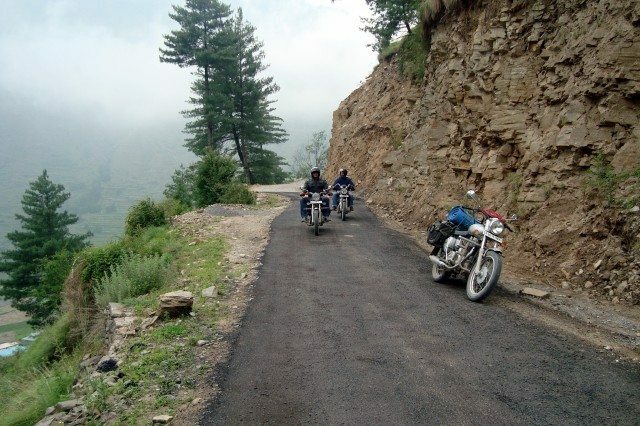 Kanwal and Surjeet were absolutely adamant that we should take the Kotkhai route. I was caught between the urge to move on and the need to wait for the rest of the group. I get only one shot at a target and can’t afford to spoil that without a justifiable reason. I had to get to the Chanshal Pass by destiny or by design. Half an hour passed with no contact with the group. Finally, I bit the bullet (not literally) and dropped a message to Paahji and Rajbir that we were taking the Kotkhai route basis local knowledge and they should follow. 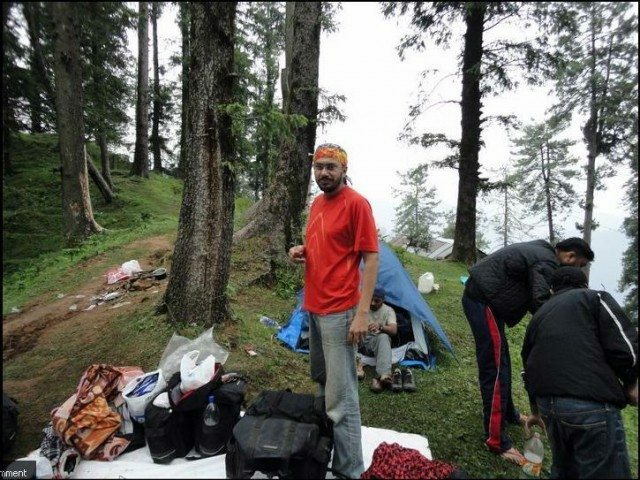 The comforting factor was that they would reach Rohru sooner or later even if they took the Narkanda-Baghi route. They were a bigger group well equipped to handle any situation. Besides, we could come back if we found the Kotkhai route too bad to start with. The road towards Chaila and Kotkhai was ok to begin with. There was road-widening work in progress and dust, more than anything else, was the big problem. We kept stopping and calling the group but to no avail. Rohru from Theog was 80 kms and we covered the first 30 kms in less than one hour. Finally, we were able to connect to the group. They had got to Narkanda and had decided to call it a day. Calling it a day at 4-30 PM in good weather was kind of surprising. Paahji told me that one of the riders was not feeling well but it was nothing serious. Hmm, that could be the reason. They were heading to the Hatu peak to pitch tents. They had dropped the plan of Chanshal pass. What we felt at that point was a combination of disbelief, disappointment, and despair. But, from where we were, there was no question of looking back. We had set out to reach Rohru before sunset and we were going to stick to that plan. As luck would have it, two tents were with them and one with us. Paahji had his comprehensive toolkit and so had I. Also, I had enough camp food stocked up to serve the three of us. Beyond Kotkhai, it was a steep climb up to Kharapathar and that was the worst stretch of that route. 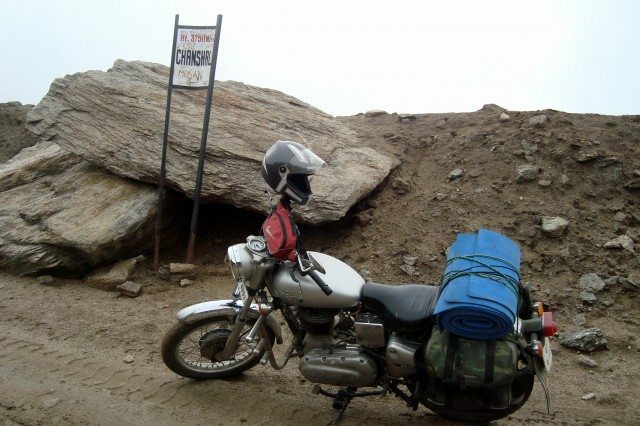 Potholes, stones, broken tar combined with sharp bends made it a grueling climb. It almost seemed like Kharapathar will never come. But finally, we got there. The sun was already on its way down. Chances of making it to Rohru before dark looked increasingly bleak. But that was no major concern. As we got closer to Hatkoti, the road started showing improvement. We took a short break to straighten our backs. Soon, we crossed the famous Hateshwari Mata temple at Hatkoti and made a dash for Rohru. To its credit, daylight stayed with us all the way and it was twilight when we arrived at Rohru at exactly 7-30 PM. We were immensely satisfied to have achieved the day’s target. But the problem was that there was no likely camping spot on view and locals told us that we had to go 15 kms further to find one. It made sense to decide against pitching the tent. It was pitch dark by then and we were extremely tired after the day’s grueling ride. We secured a room in the hotel that helped us with a bit of information. The only imbalance between the separated groups was that all the booze stayed with Rajbir. We had to buy some whiskey to break the fatigue. After a soothing bath and a couple of drinks, we remembered that we hadn’t had any major meal during the day. We kept going on my stock of nutrition bars. A sumptuous dinner at a roadside dhaba replenished our energy. Back in the hotel, we talked to the rest of the group. They had pitched tents at the Hatu peak in Narkanda and were making full use of the long evening. 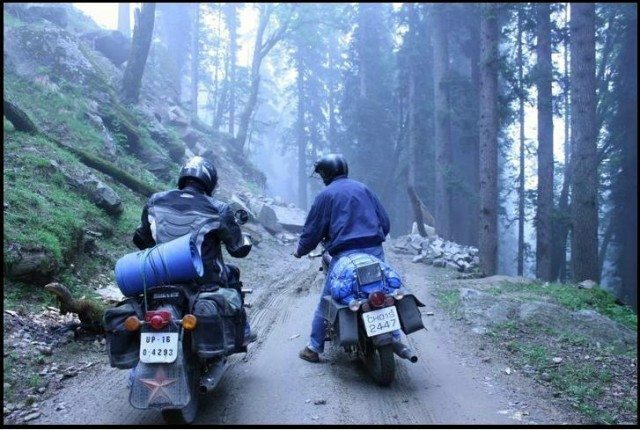 They had decided against further adventure and planned to be in Shimla the next day. They urged us to get there by evening. It was going to be a long day tomorrow. Paahji and the rest of the group wished us luck for Chanshal Pass. We had to make a very early start for Chanshal next morning, so, didn’t waste any more time and hit the sack by 10 PM. I had a wonderful six-hour sleep and was up by 4-30 AM. After packing my stuff quickly, I woke up Kanwal and Surjeet. There was a visible change in attitude in Kanwal compared to yesterday. 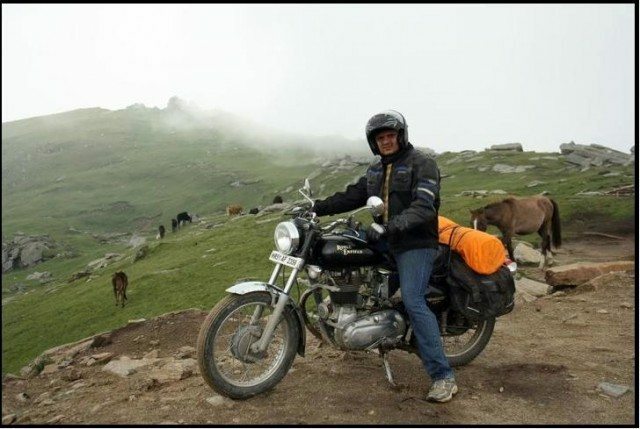 The guy who refused to leave bed at Ambala was up and running in one call at Rohru; such was the impact of yesterday’s hard riding and the excitement of getting to Chanshal Pass. We were ready to roll by 5-30 sharp. The hotel guy offered us complementary tea and we couldn’t say no. Then, started the business end of the ride. We cruised on the narrow but well-laid road along the Pabbar River towards Chirgaon. The settings were absolutely breathtaking as the sun rose above the Chanshal ranges. 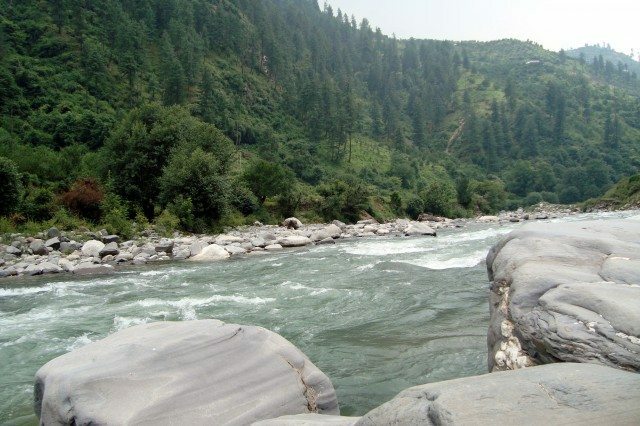 Pabbar was a raging river at many places; its roar was like music to our ears. We cruised past Maya, Chirgaon, Sandhasu, and Tikri. Beyond Tikri, the climb towards Larot started. The British had introduced trout fish in Pabbar’s waters in the Raj era. This region used to be a popular angling destination for many years. But over fishing spoiled the trout population in the Pabbar and these days, there is just one trout hatchery in Chirgaon. 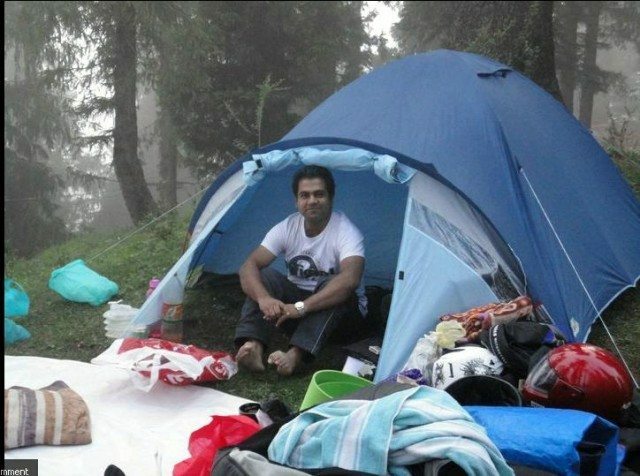 From Maya to Tikri, there was an abundance of picturesque camping spots along the Pabbar. Wish we had reached Rohru an hour earlier yesterday. To begin with, the steep road to Larot was excellent with a fair amount of freshly laid tar. But we soon left that behind and got a feel of things to expect on the way ahead. The rocky, bouldery climb was extremely steep at places. One km before Larot was Shiladesh (2480 meters ASL). 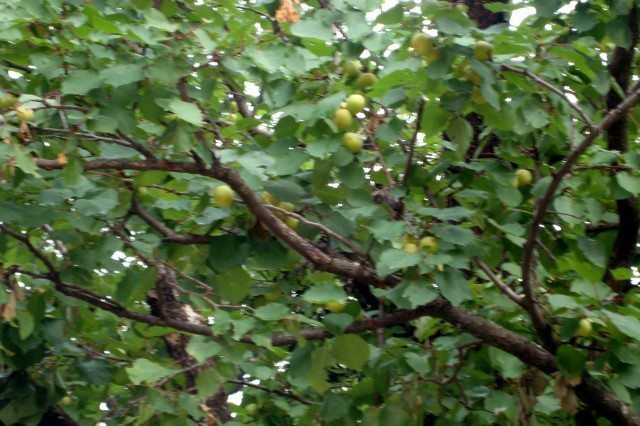 The entire stretch of Shiladesh, Larot and beyond had apple orchards flanking the narrow and steep climb. 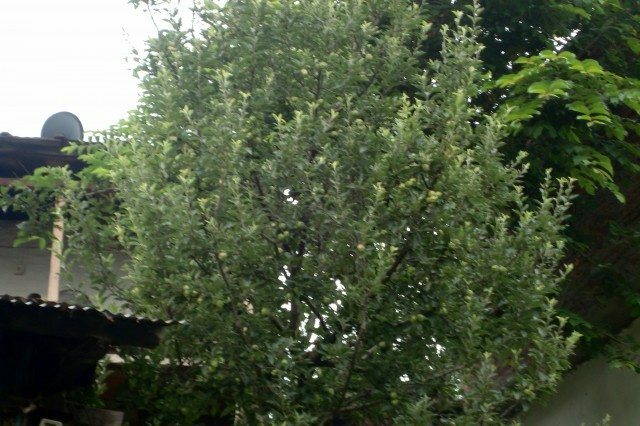 We excitedly photographed baby apples at Shiladesh. We reached Larot (2550 meters ASL) by 8 AM and decided to stop for breakfast at the modest dhaba on view. Larot is the region’s main point and has the region’s only school apart from a small hotel and a HPPWD rest house. For years, Chanshal Pass had been a popular trekking destination and Larot was its base camp. We ordered maggi from the dhaba and consumed it coupled with our cup noodles. The mighty Chanshal was just 20 kms from there. The route beyond Larot was the most scenic, most deserted, and most wild I had ever seen. 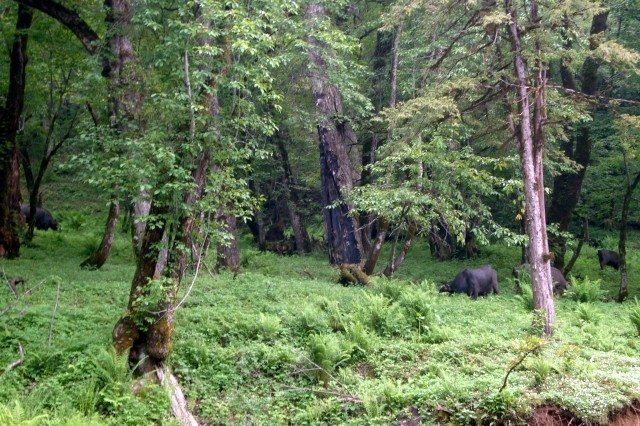 It was a wild unadulterated jungle with pine trees rising high; at most places the canopy was so thick that there was no room for sunrays to pass through. All around, there was a fresh scent of pines and other unknown plants. There were a wide variety of wild flowers on both sides of the road. It looked like a place that had never contacted pollution. The road was very steep and it was mostly first gear riding. Surjeet’s Lightning was struggling for power. Leaking front shockers made it more difficult for him. Kanwal’s 5S too wasn’t so strong. My 4S was able to pull up strong but was heating up furiously. I could see smoke emanating from its bottom. That was possibly some rare oil leak. We stopped multiple times to let the bullets cool off. The higher we got, the colder and darker it became. At many places, clouds completely engulfed the surroundings to make it tough for us to see the road. The road per se was almost nonexistent. The path was strewn with rotten pine leaves, sharp stones, sand, mud, slush, and moss. Moss stood testimony to the fact that the route was not much traveled on. There were just two thin driving lines on both sides of the track that would’ve escaped notice had I not looked for them. We fought through the tough terrain and eventually made it to the summit. The last 20 kms took us more than two hours. The mighty Chanshal Pass stood conquered; but proud nonetheless. I had made it a few minutes earlier than Kanwal and Surjeet, so, I just stood there and savored the thin air at 3750 meters ASL (12,303 ft). The highest point of the Chanshal ranges stands at 4520 meters ASL (14,800 ft). 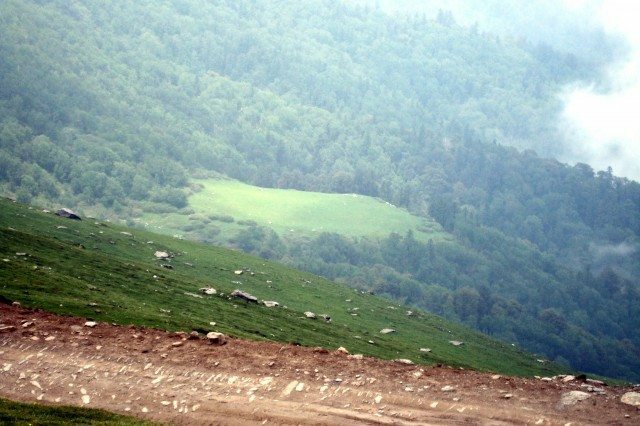 The lovely grassy slopes of Chanshal Pass are its most unique feature and the Himachal government is reportedly planning a ski resort in this area. I don’t know if that is good news. 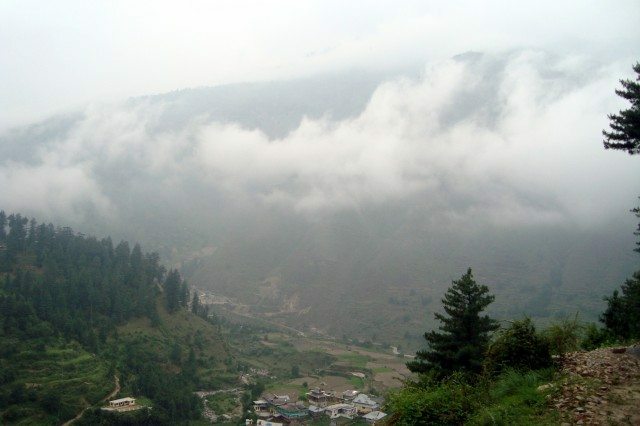 The Dodra and Kwar villages beyond the Chanshal are connected to Larot and Rohru by a daily bus service. The bus to Kwar crossed us at the summit. The passengers must have thought of us as aliens. And a very happy me! The three of us congratulated each other on the achievement. I really appreciated Kanwal and Surjeet for their spirit and tenacity. At that moment, I missed Paahji. Normally, it’s just the two of us. It would’ve been nice to have him there. Paahji says that the more we ride, kilometers keep increasing compared to kiloliters (hope you understand what that means). I hope this ride is just an aberration as far as he is concerned. We fooled around at the top for an hour or so and in the process, photographed the lovely green slopes, the herds of the gujjar nomads, the fast moving clouds, the far ranging vistas of the Chanshal ranges, and of course, our bullets and ourselves. 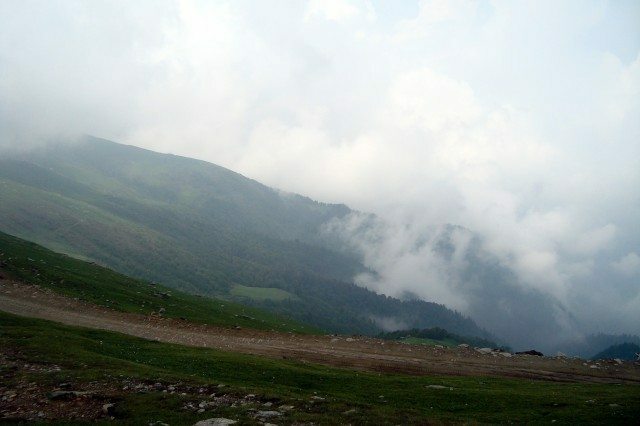 I have been to Rohtang and Jalori pass. Both were contrasting pictures and were wonderful in their own rights. But Chanshal pass was in a class of its own. For miles there was nobody around apart from the nomadic gujjars. The nearest human habitation was at Larot, 20 kms away. Dodra and Kwar were further away in to oblivion. It couldn’t get wilder than that. It is a place to be experienced before development spoils it. 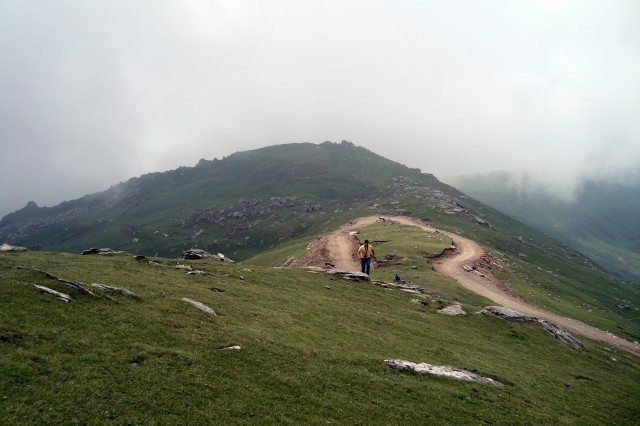 If God is kind on me, I’ll revisit Chanshal Pass and go beyond. Will spend a day or two in Dodra-Kwar then. View on the left - See the golf course like section? It was time to head back to Rohru. On our way down, we found the roads a lot more wet and muddy. It must have rained below while we were at the pass. It couldn’t be confirmed though as there was not a soul around. On our to and fro journey to the Pass, the only vehicle we crossed was the bus to Kwar. There was no sign of human habitation anywhere. We made rapid progress downhill and soon crossed Larot. It was again smooth sailing beyond Tikri along the Pabbar. Still, by the time we got back to Rohru, it was 3 PM. 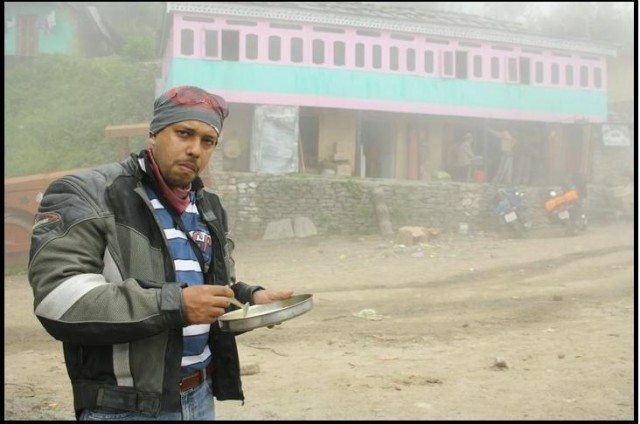 Got in touch with Rajbir and learned that the group was moving to Chail instead of Shimla. A quick visit to the ATM and refueling later, we set off for Narkanda. Rohru is a valley and Narkanda is at 9000 ft ASL. It was an uphill ride via Pujarli, Tikkar and Baghi. The road was reasonable with a few rough patches. Still it took us almost 3 hours to cover the 65 odd kms. Close to Narkanda, I again had a word with Rajbir and learned that they were camping at a place called Koti just beyond Shillon Bagh in Kufri. Another 45 odd kms from Narkanda and it was already close to 7 PM. The urge to meet up with the rest of the group made us put exhaustion aside and ride on. But it was not easy going beyond Narkanda. A massive cloud cover reduced visibility to less than five meters. We crawled as a train with Surjeet at the head. He rightly kept following the edge of the tar for guidance. On top of that, my bull threatened to die every time I lifted the throttle. May be it was bad fuel. Somehow, we got to Theog and as the surroundings cleared up, revved up for the last 15 odd kms to Kufri. It was dead dark and the road at Kufri was narrow and winding. Add to that our tired minds and bodies and it was not easy riding. I led the way carefully and reached Koti by 9-30 PM. The group had pitched tents at a government school a long way below the main road. We got a warm welcome from all. They congratulated us on our crazy exploits. But we were too tired to return the warmth. Pitched our tent quickly and drifted off to sleep. I didn’t even eat the dinner Paahji had so dearly kept for me. It had started raining late in the night. It was a first time experience sleeping in a tent in the open in heavy rain. The rain showed no respite in the morning, so, we had to get wet to break the camp. We all put our rain gears on and got going. 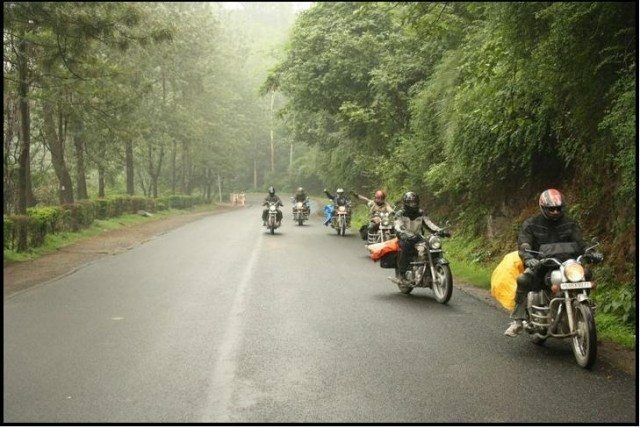 Call of home made the group ride non-stop till Solan. We had a heavy breakfast of parantha and curd before setting off again. It was still raining. We got to the plains and only after leaving Karnal behind, the rain eased off. As we were about to reach Panipat, a guy from the wayside suddenly jumped in front of my bullet. I had very little reaction time and hit the guy hard. I fell hard too. Ishwinder came running and lifted the bullet off my feet. I had broken my left arm. The drunkard apparently was a factory labor who was not in his senses. Harsh and Ishwinder made arrangements for the guy to be taken to the hospital. He was hurt and unconscious. As I sat distraught by the roadside, a couple of big-hearted locals came to my help. 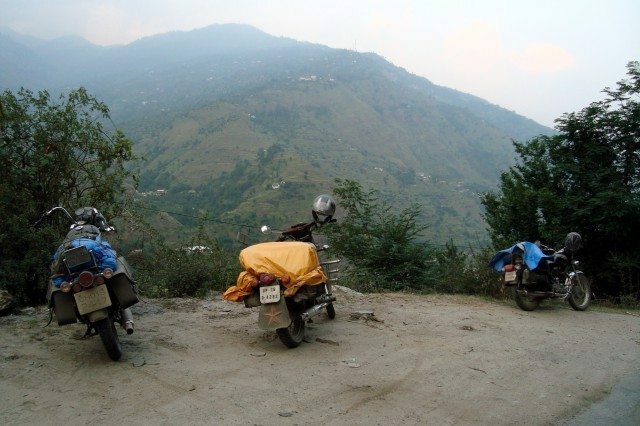 They, together with Harsh and Ishwinder, moved the bikes off the spot and took me to a hospital for first aid. The rest of the group had moved a little ahead and had to rush back as they got the news. Fate had taken a terrible turn. From there I got back home in a cab leaving my bullet behind. My family was in a state of shock seeing me plastered and bandaged. The fracture in the arm needed a surgery and another minor fracture in the right ankle needed a plaster. Currently, I am recuperating at home. My bullet is back from Panipat thanks to Harsh. Decided to share the incidence with you all as the Chanshal Pass ride may well turn out to be my last. Not that I am scared. I know accidents happen when they are destined to happen. But it’s tough on the family. They’ve always been very supportive. But a crash on the highway was a little too much to handle. Giving up a passion for my family will be too small a sacrifice. Any regrets? Couldn’t answer that call of Leh-Ladakh. But, never mind! Excellent… The write up, the pics and the spirit…. It is kind of unfortunate when this happens and that too when you are so close to the home… Hoping for your speedy recovery…. Paaji, very well written. I think it sums up everything:) And we are going to Chanshal pass once again…..and in a better way of course!!!! Thanks buddy. I am happy we achieved this together. Really enjoyed riding with you guys. Hang there Mr. Nandi, steady and calm. Was it dark when this happened ? Your story of grit and determination is a great inspiration for a lot many so hang there and it would pass. Wishing you a super-speedy recovery and good times for you and your family. Warm regards – Nandan. 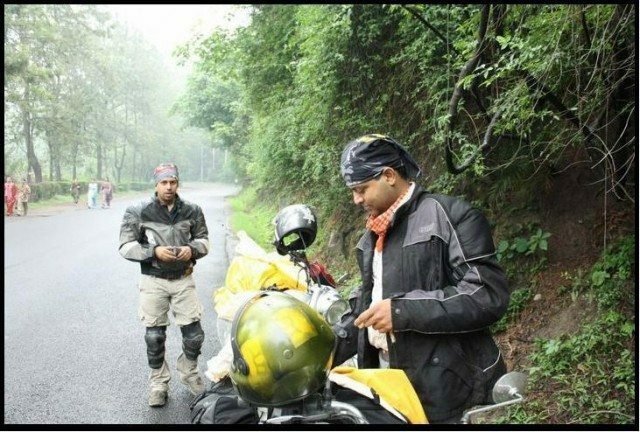 Dear Anand, i wish u a speedy recovery and hope that we meet soon on yet again ride to the Mighty Himalayas. 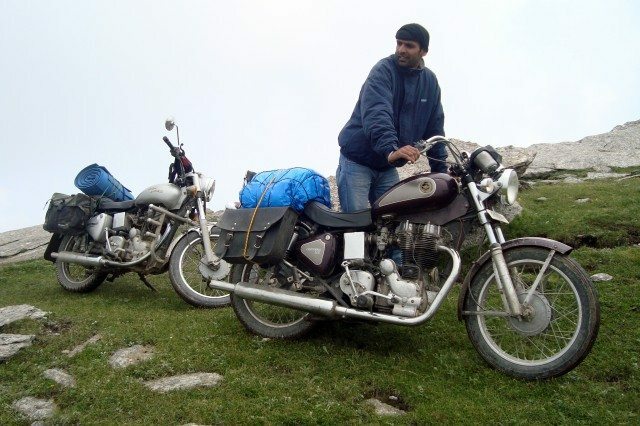 Congratulations on conquering Chanshal Pass, Anand. 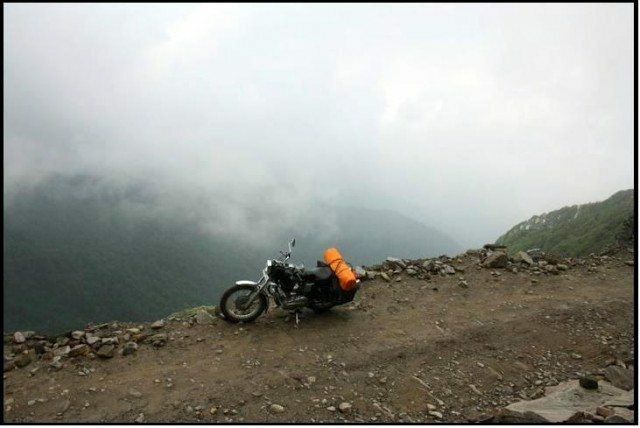 It is hard luck that such an adventurous and fulfilling ride had to end like this. Hope you get better soon. I wish you many safe rides ahead. Thanks a lot Vibha :). O pahhji don’t loose hope. We will definitely do Leh – Ladakh in coming yrs & pl. don’t say that its all over. Our families do understand our PASSION for Riding. Let’s wait for the time when they will say “Beta Go ahead…or… Sunoji tum jao” & also what about our equation of Kms Vs Kiloltrs. B positive yaar. 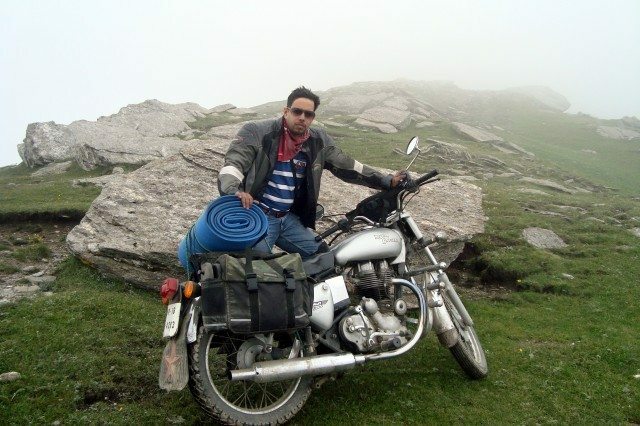 Vishal paaji…i will go to leh with you …and i will go there many times…just let me come back !!!! It was unfortunate what happened to u after such an amazing ride.Wishing u a speedy recovery and many more lovely rides. 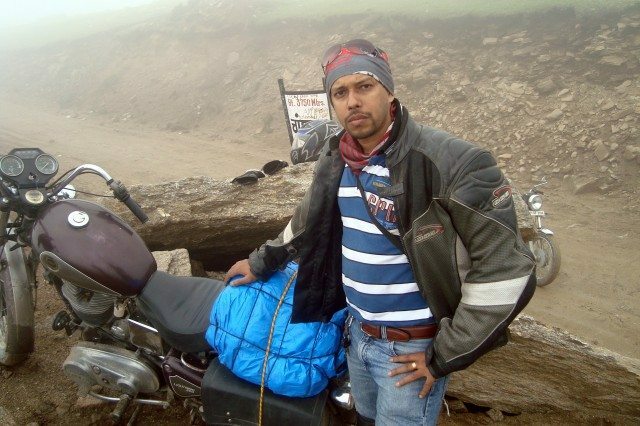 really good journey, anand you are really enjoing nature and your ride. I am really very impressed with your passion. Hope you will doing good ahead. that’s good, I like unexplored & untuoched beauty of nature. thanks 4 some good images. Vibha, I receive communication from Ghumakkar. Are you talking about anything in particular? Yes, in fact I sent you some emails on your rediffmail account about an interview. Have you received them? If not, can you send me your email address at vibha@ghumakkar.com so that I can send those emails again? very well written! im sure it must be a hell of a ride! ive done most of my trips down south from delhi and towards rajhasthan and gujrat. Am considering to make a trip to chanshal. Is it a good idea to go without tents or jut or 2 people to go together? What a great journey in the great landscapes. Thanks for sharing this. Excellence…….i have gone through number of posts in this site……but i m very much impressed after reading about your courage n great journey covered by yourgudself. Very well impressed by your description of words about this beautiful journey. U r a writer bro. I m inspired by your journey. Your words describe how much you enjoyed your journey.Your writing is very impressive. Beautiful pictures. Thanks for sharing. Really enjoyed reading your impressive writing. Andhra was a bastion of Buddhism for at least a thousand years. 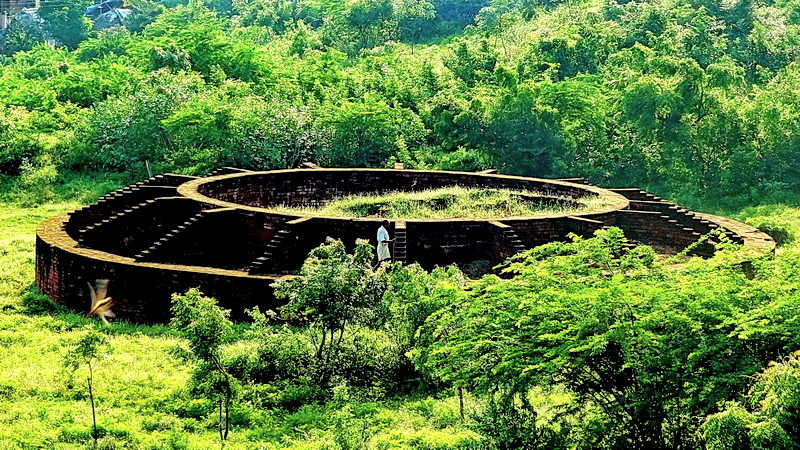 It was a centre of learning and Buddhism spread out to Sri Lanka and South East Asia through its ports. The stupas and monasteries provided the architectural models for the more famous Buddhist shrines in the rest of the world like the famous Borobodur in Indonesia. The Buddhist phase lasted for nearly a thousand years till the rise of Shaivism in the 7th century CE obliterated Buddhism from this region. It is sad that while these places attract visitors from all over the Buddhist world, Indians are not aware of the existence of these places.In this series, I am retracing the footsteps of those distant ancestors of mine.